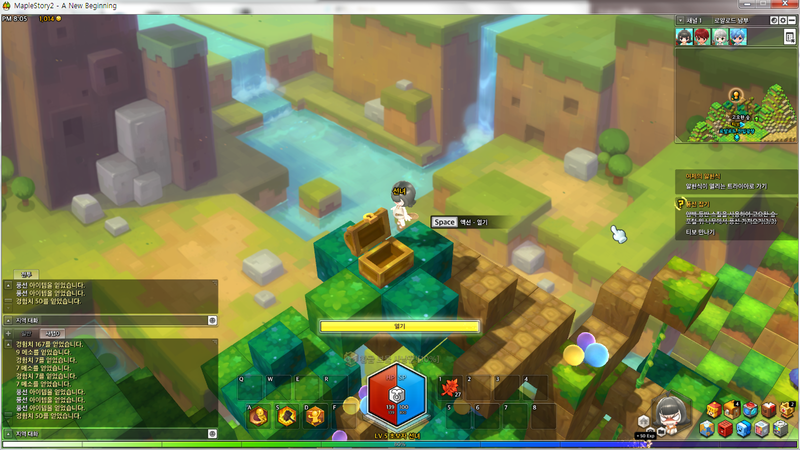 Home > MapleStory 2	> MapleStory 2 – Alpha Test Begins! 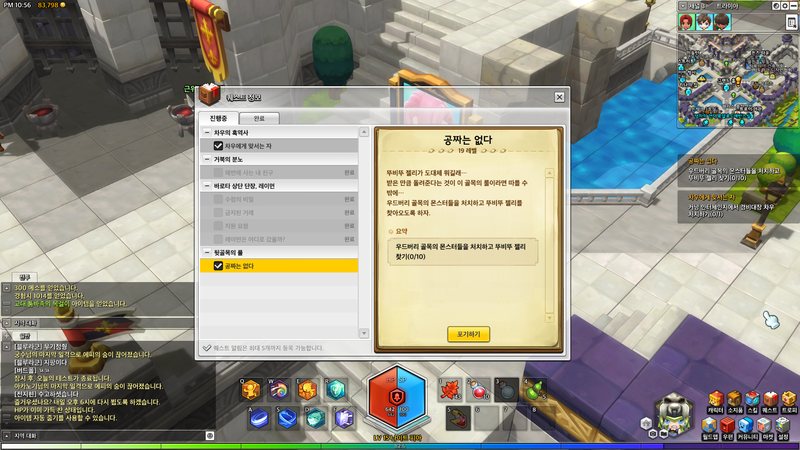 MapleStory 2 – Alpha Test Begins! 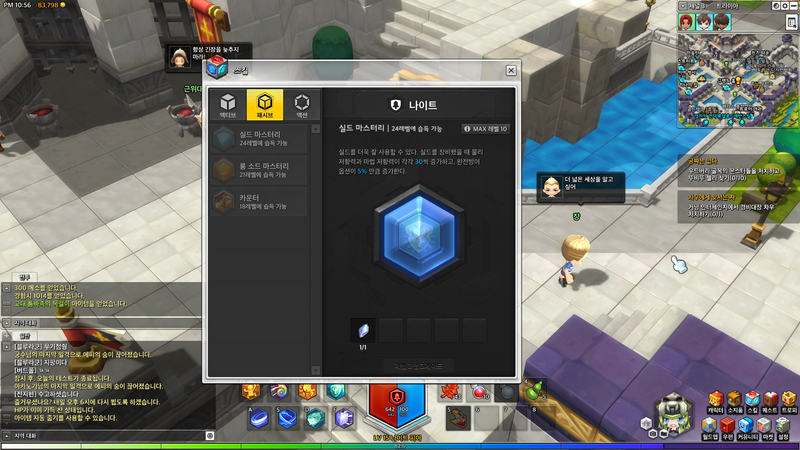 Today marks the first day of the Alpha test for MapleStory 2! A lot of users have been posting screenshots and videos, which is all I can share with you since I didn’t get in myself. Still, there’s a lot of information and this game looks really good in my opinion! 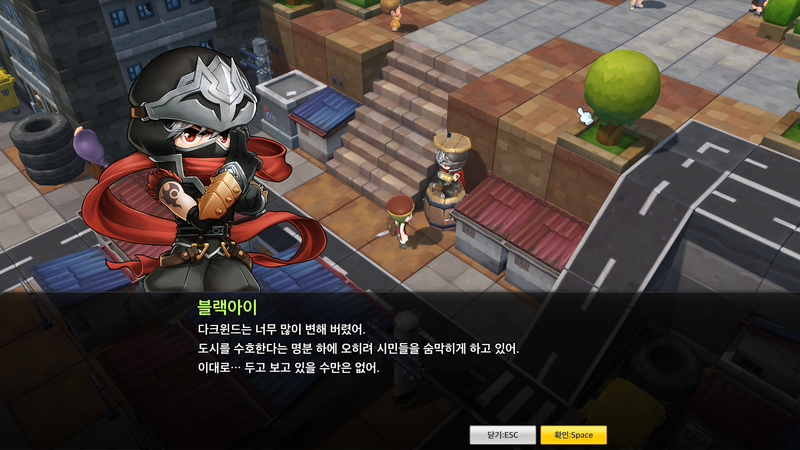 Check past the cut for information about the UI, various game features, and the job skills! There’s a ton of stuff I want to talk about so let’s get straight to it! Just a reminder that there was also a lot of information in my previous post, so check that out too! 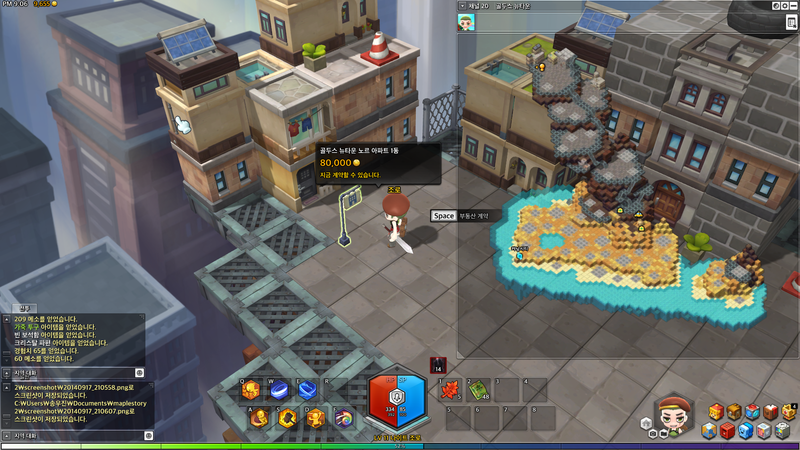 The story line of MapleStory 2 focuses on the Lapenta, a place where great evil was sealed away. Protect the Lapenta in order to keep this evil out of Maple World! Remember to press CC to see the subtitles! 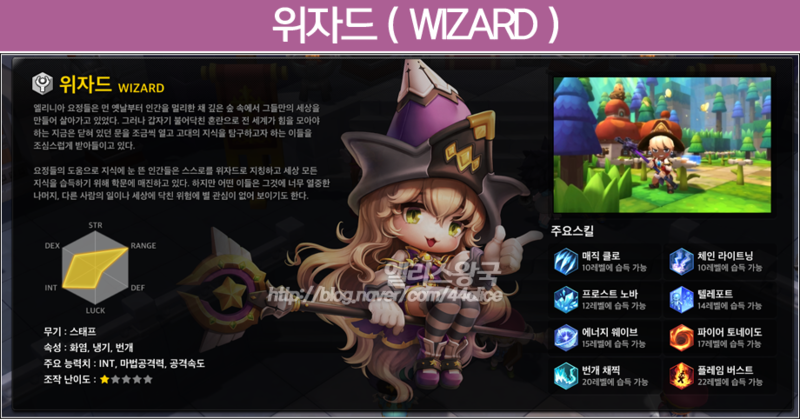 The tutorial of MapleStory 2 explains all the new concepts used in this game, you can watch it for a quick overview of how the game plays. The NPCs in this game all have artwork and voice acting, so its much more interactive than MapleStory. Let’s talk about the UI first. At the bottom you’ll see two chat windows, the first is for ‘battle messages’ such as mesos and items you have picked up. 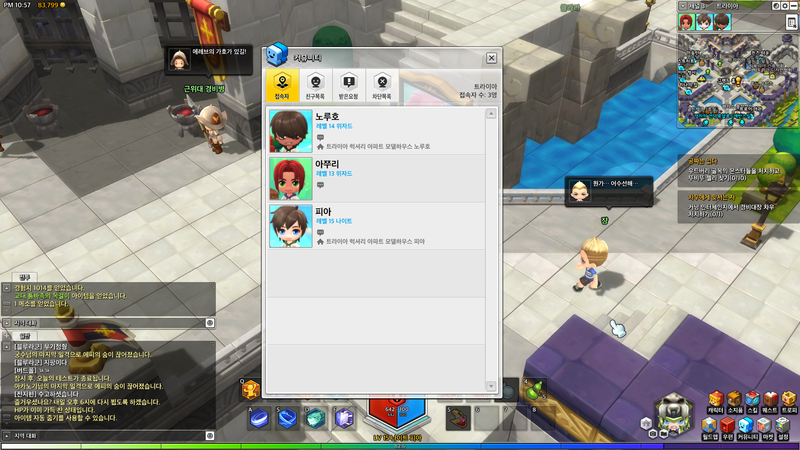 The second is the regular chat window for talking to other players. 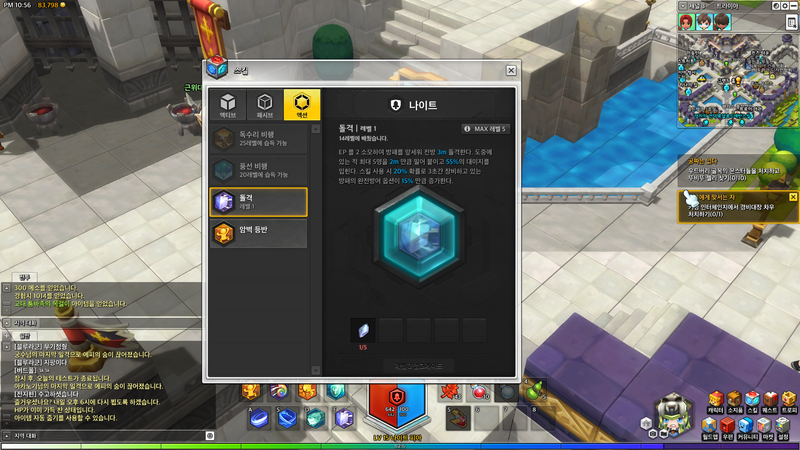 Then there are you skills and item hotkeys, and in the middle is your HP and SP (in the form of a hexagon). Below those is your EP bar, which is used for action skills. At the bottom of the screen, going across the entire way is your EXP bar. 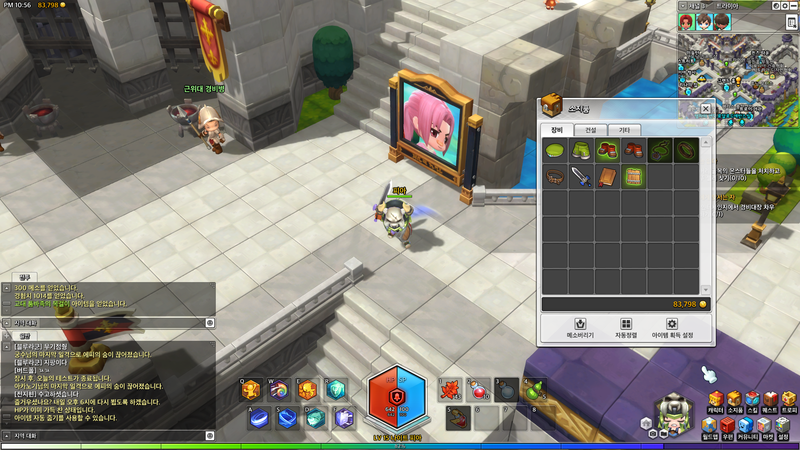 On the right side is your character and all the menu items like inventory, world map, settings, etc. You can open the character information window to see information at a glance. It shows all your equipment, stats, when you started your character, your home, your level and job, and your profile image (which you can change). At the top right of the map is the minimap, and right below it is the quest helper window. 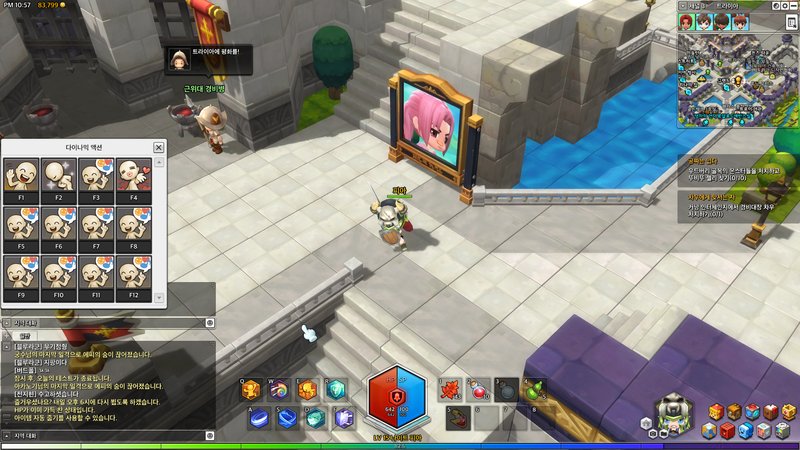 At hte top left is the time and your currently held mesos. The inventory is a bit different now. It’s split into three parts, the first is the Equip section which of course holds all your equipment. The second is the Construct section, which holds things like furniture and decorations for your home. The final one is the Etc section, which holds monster drops, potions, and basically anything that doesn’t fit in the first two. You can make your character do a ton of dynamic actions with the F keys, they’re like the faces from MapleStory except your character moves their entire body! Some are really funny haha. Here’s the friends list, where you can see your friends, their current level and job, their status message, and also their home. Here’s the skill window! All the skills are encased is crystallized hexagons, and are unlocked after a certain level. 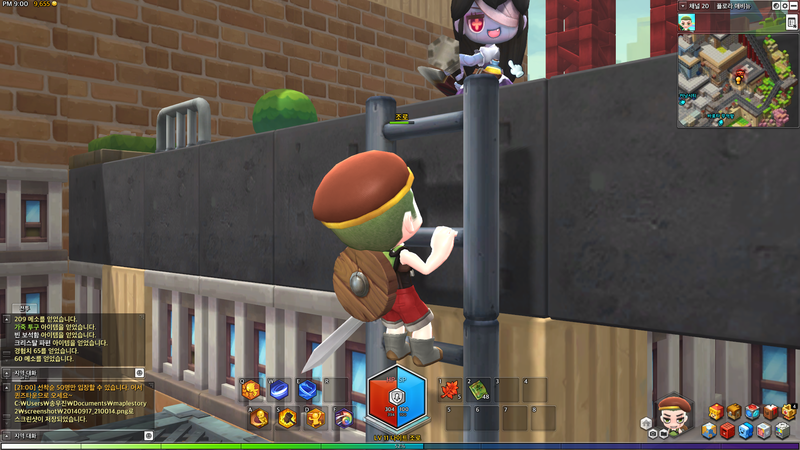 To level up the skills, you need to collect Crystal Fragments (seen at the bottom). The skills are separated into Active, Passive, and Action skills. The world map is huuuuge, and it shows every map! I think the greyed out areas are places you have not been to yet. There’s a letter system where you can write and send letters to other users. 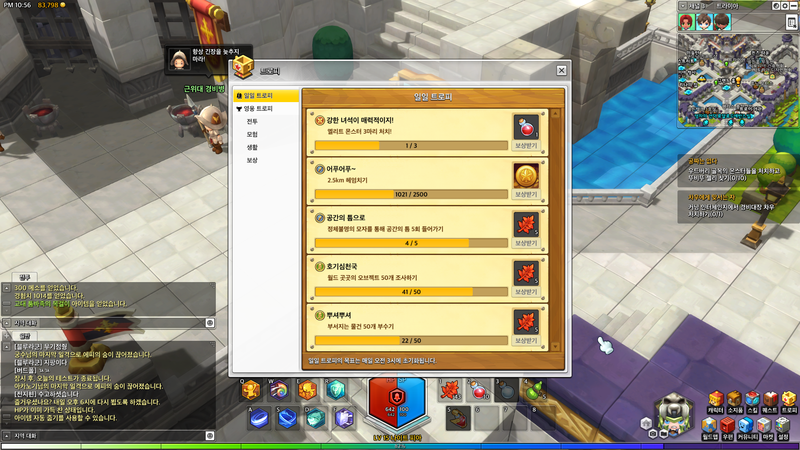 The quest window is very similar to the original games, with in progress and completed quests and a small description along with what is required to complete the quest. Here is the market where users can sell items to other users! As you can see, a lot of the items are customized items that other users have created, I’m excited to see the amazing variety of equipment! Speaking of which, here’s a short video that shows how easy it is to make your own items! They literally use Paint for this, so I’m sure some people will be able to do much better with other programs. 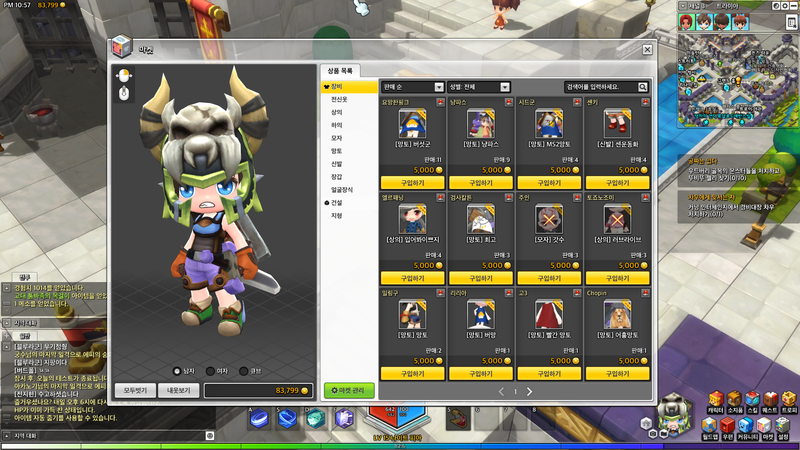 There’s a folder in the MapleStory 2 directory for putting in these custom sets, although I’m wondering how they’ll patrol users with… inappropriate clothing haha. 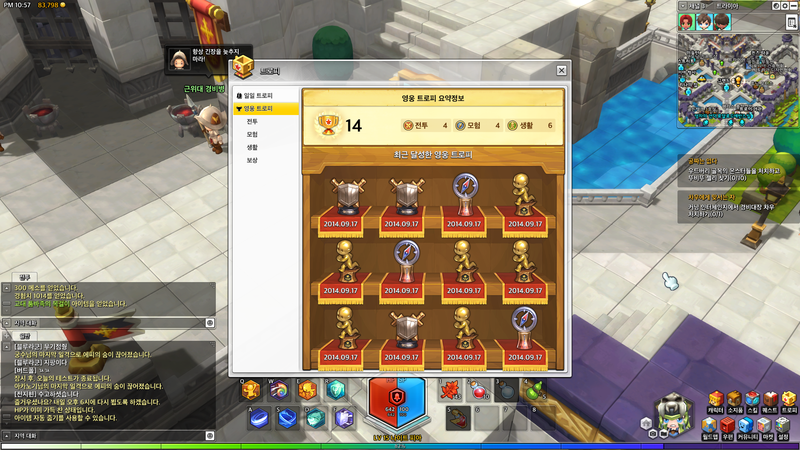 The game also has a new Trophy system. If you guys have played Pokemon Black or White, this system is very similar to the medals that were given out in that game. There’s so many different ones, such as for battle or for adventuring, like walking a certain amount or killing certain monsters. I want to collect them all! 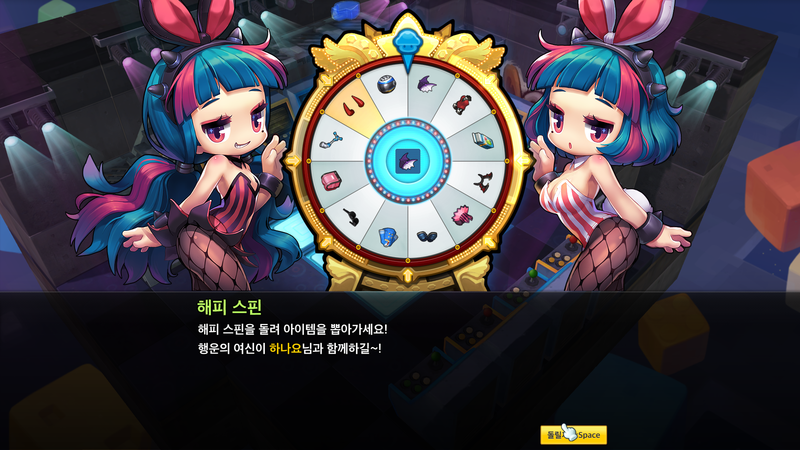 There’s something called the Happy Spin, where you can spin the wheel and get special equipment! Those girls are a bit… provocative haha, I think in-game they’re just called Bunny Girls. Like I mentioned before, when you die in this game you can wait for another user to destroy the tombstone that falls to revive you. However, they must do it fast or else you’ll be teleported back to town. If you are revived, there will be a penalty taken from your HP and SP (in this screenshot it says it will take 15% of your max HP and SP for a certain period of time). 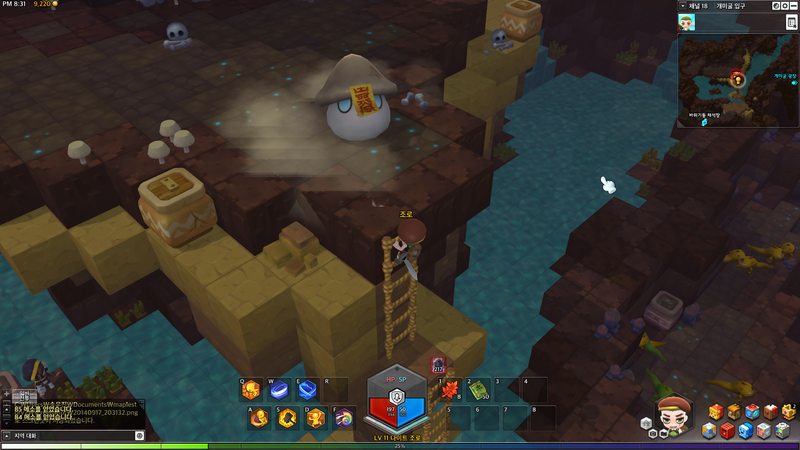 There’s also a lot of treasure chests strewn about, explore Maple World and find special goodies! In addition to the bosses mentioned beforehand, older ones such as Stumpy and Zombie Mushmom, as well as new ones such as Marionette join the battle! Fight them with your friends for big rewards! Here’s a video of some users fighting Urza, it’s a bit sped up and the person that recorded it obviously doesn’t have that great of a computer, but it’s fun to see you’ll have to work hard to dodge boss attacks. Level 1: Deals 25% damage 2 times on up to 5 enemies. If you hit an enemy successfully, heal 5 SP. Level 1: Consumes 20 SP and swings your longsword around you, hitting up to 8 enemies for 65% damage 2 times. Enemies hit are pulled towards you slightly. Level 1: Consumes 10 SP and throwns a shield at an enemy within 9m, dealing 75% damage and decreasing their defense by 15% for 10 seconds. After hitting an enemy, the shield will bounce to other enemies up to 2 times. Level 1: Consumes 2 EP and rushes forward 3m. Up to 5 enemies within 2m will be hit, dealing 55% damage. 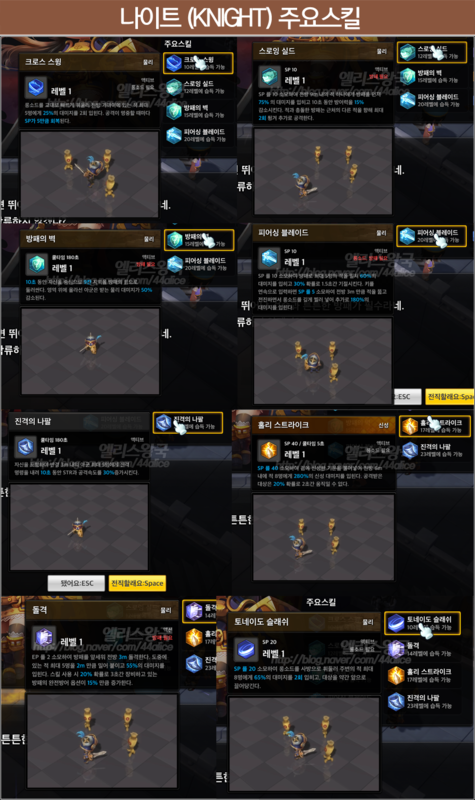 After using the skill, there is a 20% chance to increase your shield’s defense by 15% for 3 seconds. Level 1: For 10 seconds, increase your shield’s strength in 9 blocks around you. While in this area, you and your party members will take 50% reduced physical damage. Level 1: Consumes 40 SP and infuses your sword with a holy aura, hitting up to 8 enemies 6m in front of you, dealing 280% damage. Enemies hit will have a 20% chance to be immobilized for 2 seconds. Level 1: Consumes 10 SP and hits 5 enemies around you with your shield for 60% damage with a 30% chance to stunning them for 1.5 seconds. Pressing the key again will consume 5 SP and stabs your longsword forward 3m for an additional 180% damage. Level 1: Blow a horn for you and up to 5 party members within 3m, increasing your STR and attack speed by 30% for 10 seconds. Cooldown: 180 seconds. Level 1: Hit up to 3 enemies 8m in front of you with the power of magic for 20% damage 2 times. If you hit an enemy successfully, heal 5 SP. Level 1: Consumes 12 SP. Hit up to 8 enemies 7.5m in front of you with the power of lightning, dealing 70% damage. Holding down the skill key will continue the attack. Level 1: Consumes 10 SP. Create a cold frost, hitting up to 8 enemies 8m in front of you for 75% ice damage and lowering their movement speed by 50% for 3 seconds. Level 1: Consumes 2 EP to teleport 3m forward. Level 1: Consumes 40 SP. 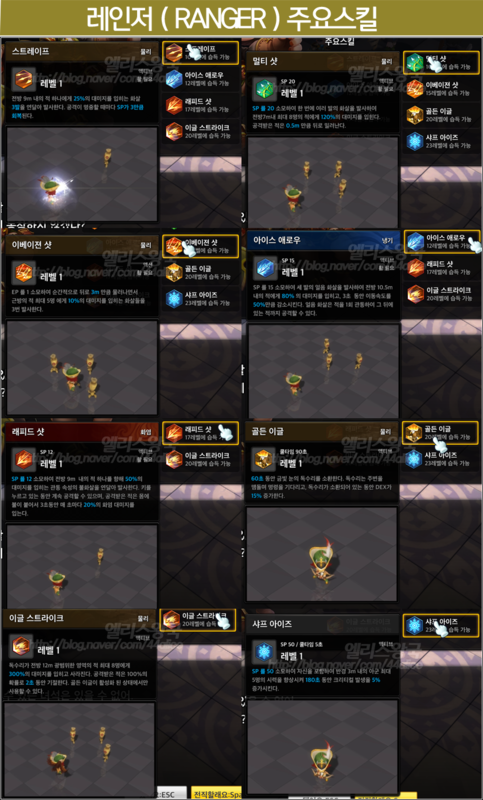 Create a magic explosion, hitting up to 8 enemies 4.5m around you for 100% damage while pushing them back 1.5m. If an enemy is affected by Frost Nova’s freeze effect, they will take 150% extra damage. Level 1: Consumes 40 SP. Create a fire tornado which moves forward 7.5m. Any enemies in its patch will be hit with 180% damage and will be burned, dealing 10% damage every second for 10 seconds. Level 1: Create a whip made of lightning, hitting up to 5 enemies within 7m and dealing 55% damage 2 times with an 80% chance to electrocute them for 2 seconds. Level 1: Consumes 7 SP. 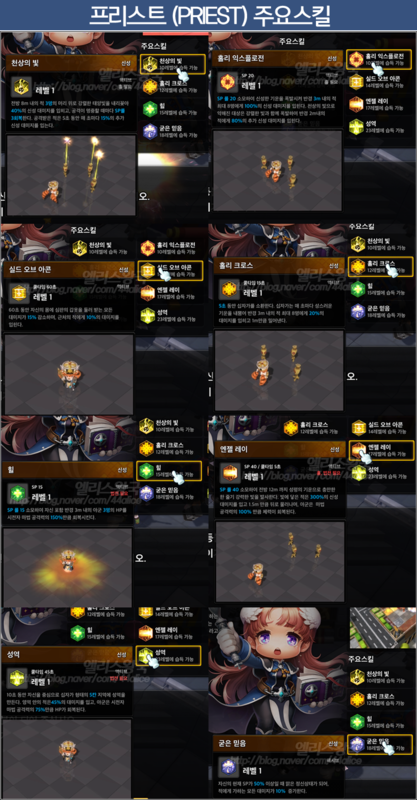 Create a flame that explodes, hitting one enemy within 9m, dealing 70% damage. 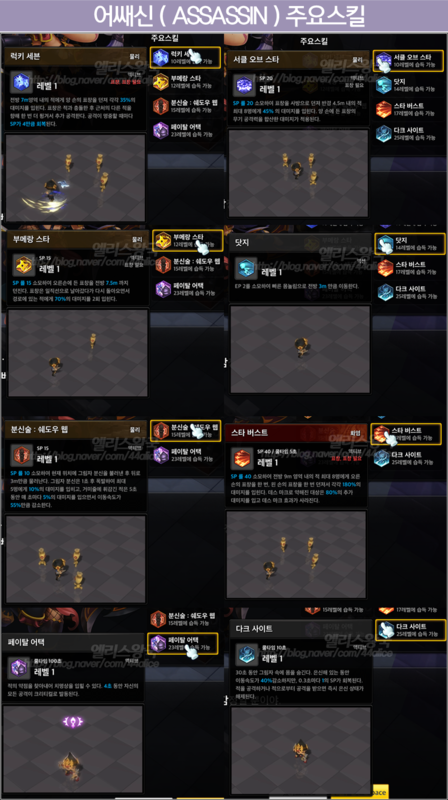 This skill will hit critically and if an enemy is affected by Fire Tornado’s damage over time, they will take 50% extra damage. Level 1: Hit up to 3 enemies 8m in front of you with holy light, dealing 40% damage. If you successfully hit an enemy, heal 3 SP. 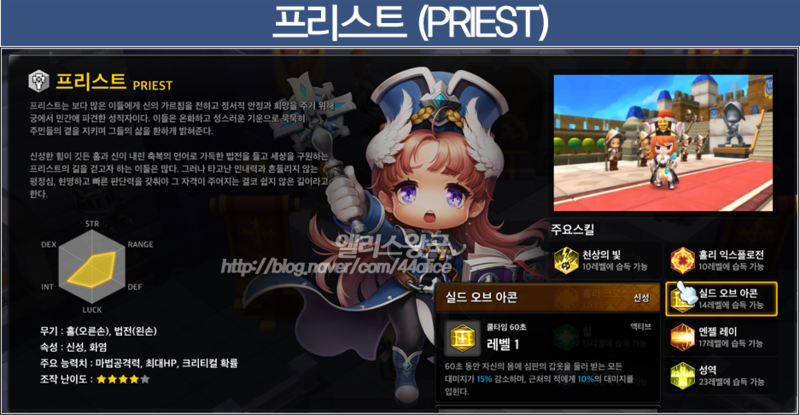 After attacking, enemies will take 15% increased holy damage for 5 seconds. Level 1: Consumes 20 SP. Use your holy aura to create an explosion, hitting up to 8 enemies within 3m, dealing 100% damage. Enemies within 2m who were hit by Heaven’s Light will take an extra 80% damage. Level 1: Summon a holy cross for 5 seconds. Every second, up to 8 enemies within 3m of the cross will take 20% damage and be pushed back 1m. Level 1: For 60 seconds, protect yourself with holy power, decreasing damage taken by 15%. Enemies around you will take 10% damage. Level 1: Consumes 15 SP. Heal 150% of your magic attack as HP for you and 3 other party members. Level 1: Consumes 40 SP. Create a ray of holy energy, hitting enemies 12m in front of you for 300% damage. Allies within 1.5m of the ray will be healed for 100% of your magic attack. Level 1: When your SP higher than 50%, you will deal 10% increased amage to monsters. Level 1: Create a holy area (5 blocks parallel and perpendicular to your current block) for 10 seconds. Every second, enemies standing on the area will take 45% damage while allies standing on it will be healed for 75% of your magic attack. 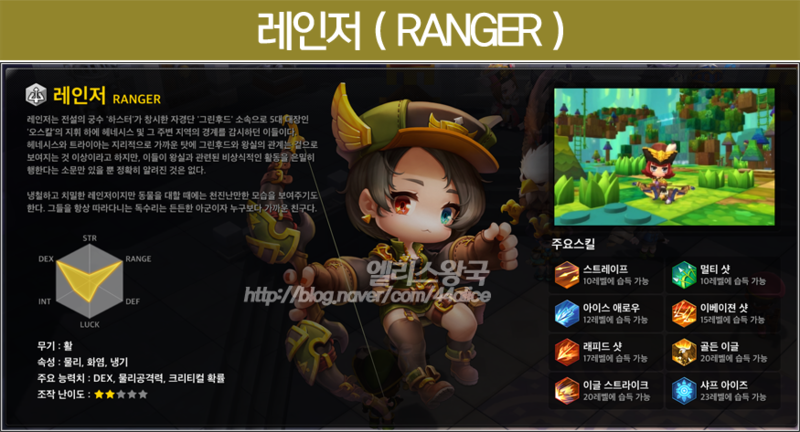 Level 1: Shoot arrows at one enemy 9m in front of you, dealing 25% damage 3 times. If you hit an enemy successfully, heal 3 SP. Level 1: Consumes 20 SP. Shoot arrows at up to 8 enemies 7m in front of you, dealing 120% damage. Enemies hit will be knocked back 0.5m. Level 1: Consumes 15 SP. Shoot an ice arrow 10.5m in front of you, dealing 80% damage 3 times. Enemies hit will have their movement speed decreased by 50% for 3 seconds. Level 1: Consumes 1 EP. Jump backwards 3m and shoot arrows forward, hitting up to 5 enemies for 10% damage 3 times. Level 1: Consumes 12 SP. Shoot a fire arrow, hitting enemies 9m in front of you for 50% damage. Holding down the skill key will continue the attack. Enemies hit will be burned and take 20% damage every second for 3 seconds. Level 1: Summon a golden eagle for 60 seconds. The eagle will wait for a command and while it is summoned, your DEX will be increased by 15%. Level 1: The golden eagle will soar 12m in front of you, hitting up to 8 enemies for 300% damage. Enemies hit will be stunned for 2 seconds. The golden eagle must be summoned to use this skill. Level 1: Consumes 50 SP. Increase the critical rate of you and up to 5 allies within 3m by 5% for 180 seconds. Level 1: Throw both hands’ stars at enemies 7m in front of you, dealing 35% damage each. The stars will then bounce to another enemy. If you successfully hit an enemy, heal 4 SP. Level 1: Consumes 20 SP. Throw a circle of stars, 4.5m around you, dealing 45% damage to enemies hit. This skill will the sum of your left hand’s stars and right hand’s. Level 1: Consumes 15 SP. Throw your right hand’s star forward 7.5m. The star will travel forward then return after a short period of time, dealing 70% damage 2 times to any enemies in its path. Level 1: Consumes 2 EP. Quickly move 3m in one direction. Level 1: Consumes 10 SP. Summon a shadow clone at your current ocation and move backwards 3m. After 1 second, the clone will explode, dealing 10% damage on up to 5 enemies around it. 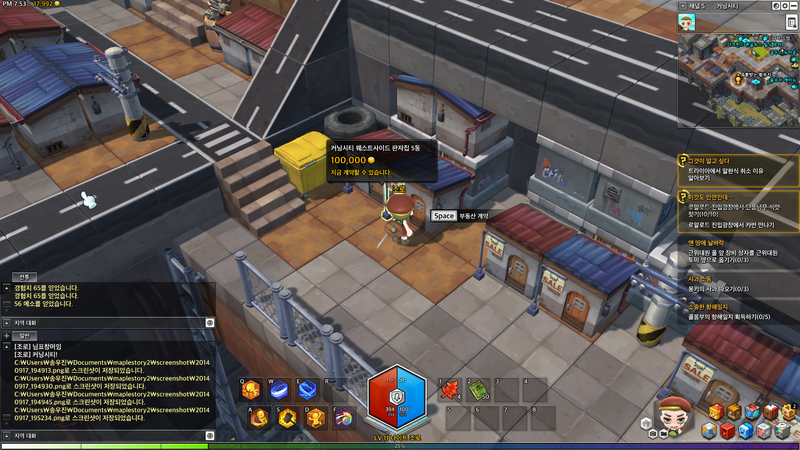 Enemies hit will take 5% damage every second for 5 seconds and their movement speed will be decreased by 55%. Level 1: Consumes 40 SP. Throw your left hand’s stars once then your right hand’s stars forward 9m, dealing 180% damage each on up to 8 enemies. Enemies with a Death Mark will take 80% additional damage and the Mark will disappear. Level 1: Find your enemies’ weak spots, your attacks will critically strike for the next 4 seconds. Level 1: Conceal yourself in the shadows for 30 seconds. While hiding, your movement speed will be decreased by 40% and every 0.3 seconds you will heal 1 SP. Hitting an enemy will instantly remove the Dark Sight effect. 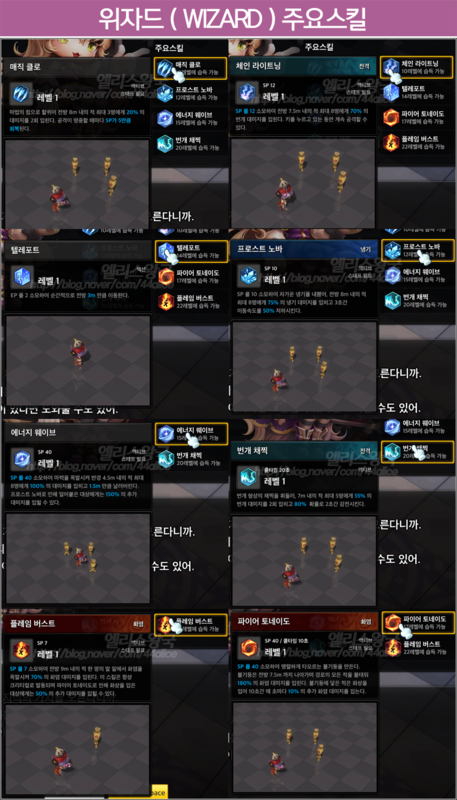 Thanks to 엘리스 of Insoya for the pictures of the skills above! The system you find in Pokémon Black & White is commonly called “Achievement” system most of the time. Many games have them on X360 (achievements), PS3 (trophies), and Steam (achievements). Nintendo lacks them… *Sniff* *Goes back to blogging* I should stop speaking to myself like that… or am I…? does this story have ANY relation with ms1 story? I don’t think so, there might be small hints/references but otherwise it should be its own storyline. 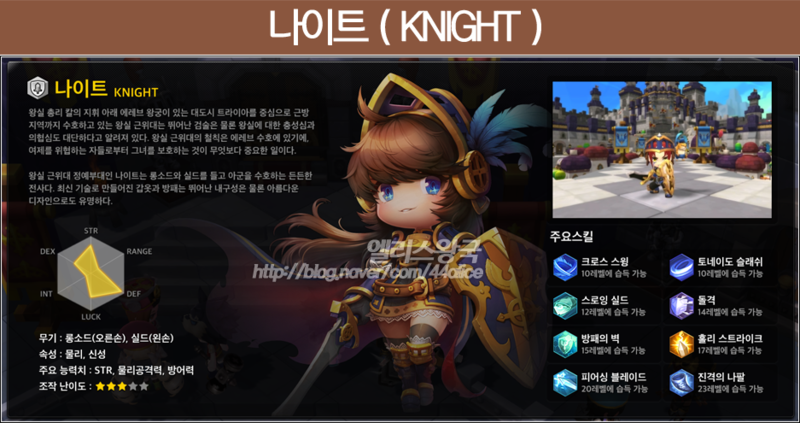 Terrible,Maplestory had a unique play style. He has a right to his opinion. He doesn’t like it, which is FINE. I wish people would stop attacking those who don’t like it. At any rate, you can’t guarantee it’s better. All we have so far are some videos. It could be even more of a grind. And what makes these kinds of characters more unique? Someone is GOING to look like you. It’s inevitable. MS1 has a ton of hairstyles and faces to choose from. Most people choose NOT to. 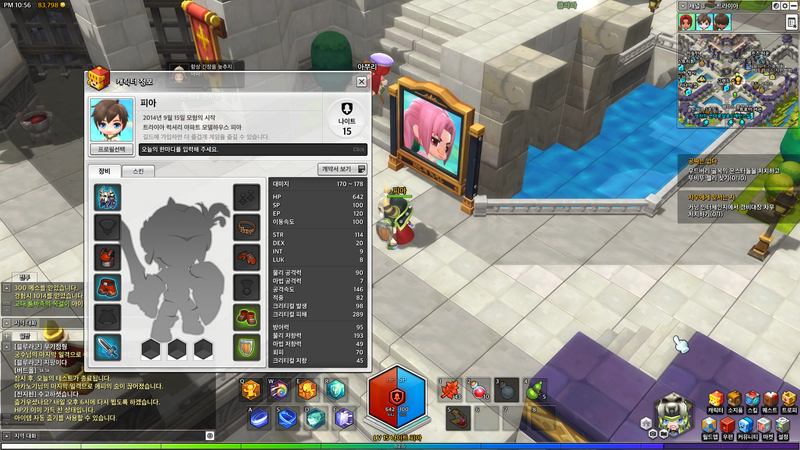 MS2 may have the ability to lengthen hair or change the part, but it seems to have a low amount of styles overall. And the clothes seem pretty limited, too. And I doubt a bunch will be added much because they’d have to make different versions of each every time. And MS isn’t nothing but grinding. It has a story to play through, quests to do, PQs, games, and a bunch of other stuff to do that most people don’t bother with because it isn’t efficient to level that way, But it’s a lot more fun. MS1 has a ton of hairstyles? hah. 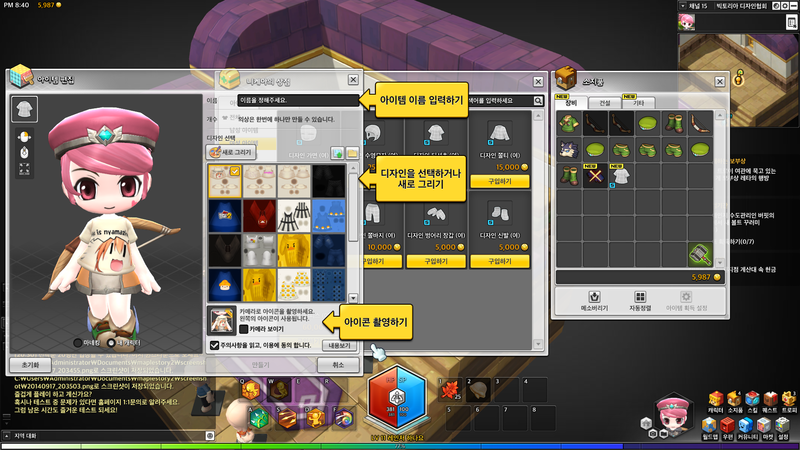 you’ll need to PAY to buy those cool ones (which I don’t mind, but most people hate it) Clothes are not limited, You can go to the shop in Castle of Aria and make whatever clothes you want. I would even make a transparent shirt for those characters who want to show their body. MS1 IS Grinding. Nobody likes the fun way anymore. Its just 30 levels of grinding in a few hours, maybe 50 levels of grinding! what’s the fun in that? The only Fun they have is when they are satisfied with their level. (Example is that Maple-Monopoly thing) And that’s why there will be a Star Planet. But that may be P2W too. everyone has a right to their opinion. . .
but every opinion has the capacity to be ill-informed to such a degree as to be flat out wrong. 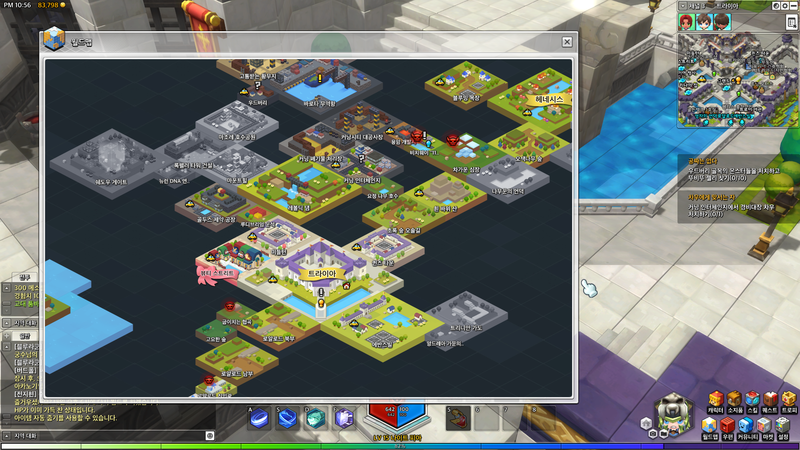 as is the case with anyone saying the Old Days of maplestory1 were good. they’re mixing up it’s old community with it’s old gameplay. the community was good, but the gameplay was terrible. slower lvling= worse gameplay…. `bad logic. Only because others copied it. On the flip side, neither is 3D. Almost every MMO in existence is 3D. 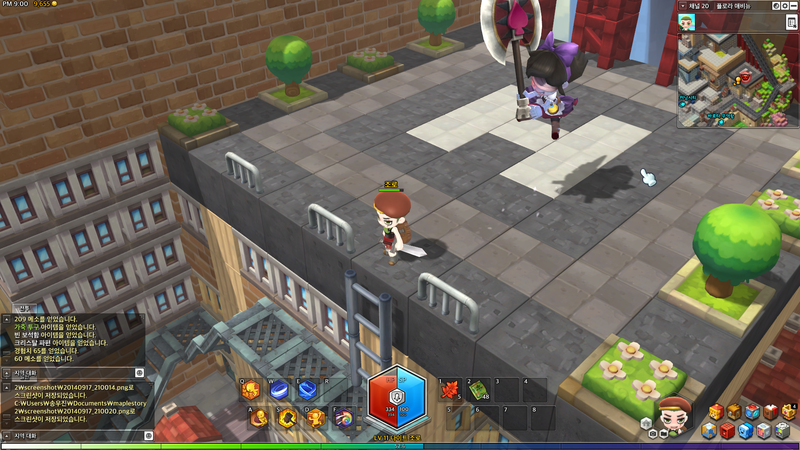 And this game looks like Spiral Knights, and a bit like Minecraft. It’s not completely unique. 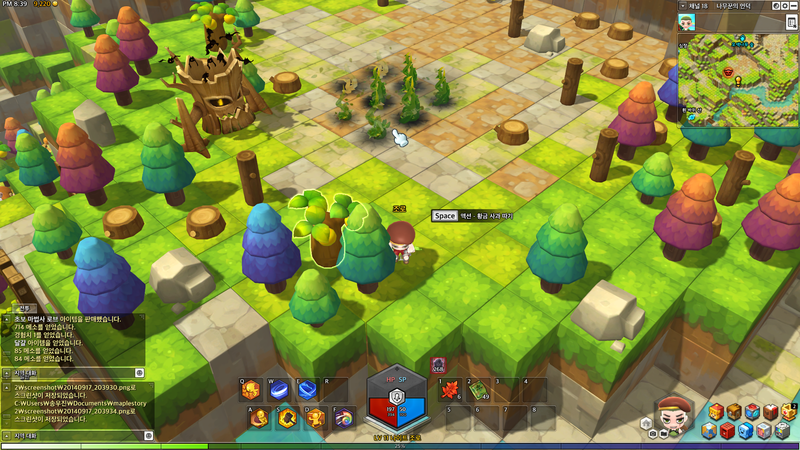 I agree Maplestory as it now is pretty simple due to it’s 2D nature and how it was structured, Sit in one spot, spam skills and pots. 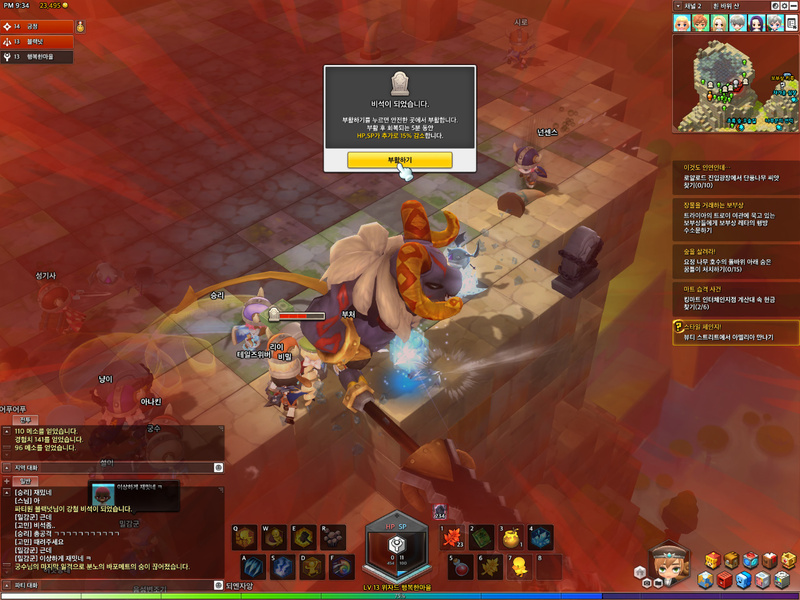 The combat in MS2 looks much more dynamic, especially when it comes to the boss fights, and that isn’t its only feature. 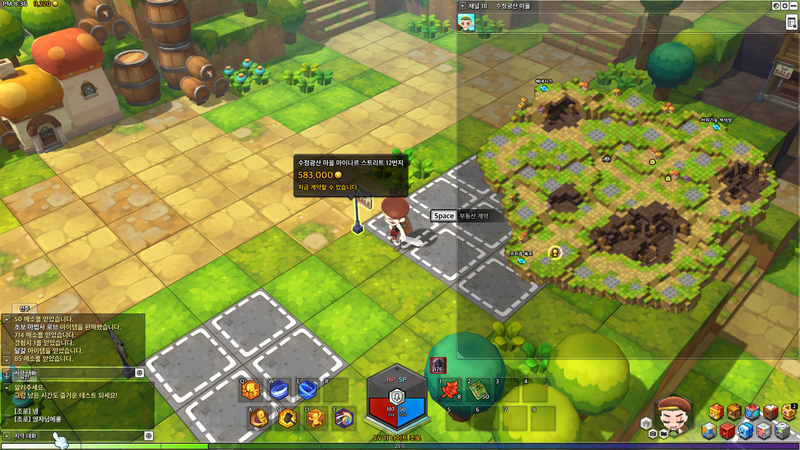 To be fair that MS does have more features, but compared to MS2 features it seems to overshadow it. 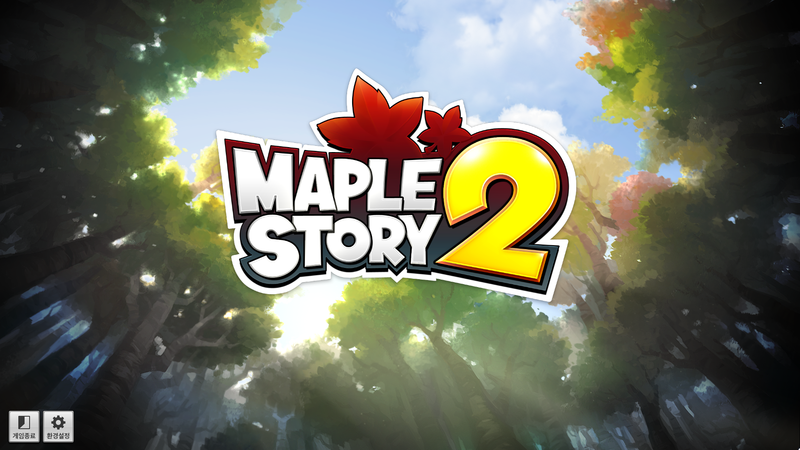 I’m not saying maplestory wasn’t fun or didn’t look nice, it was great for its time though grinding in that games gets really tedious and boring. how many characters can you create per account? Right now I think 5. Hey Max! Does this mean that the number of houses in the game are limited? Since, the maps are not infinitely large right? Good question, I’m not actually sure haha… I guess in Alpha it won’t be a problem with the small amount of players but they’ll probably have to figure something out before the full version comes out. Why there are only 5 jobs? Where are the other 3? They are not open for testing for this Alpha test. Wow. Rangers and Wizards are op. Kinda sad the paladin class didn’t come back. They basically merged Crusader/Paladin into one class, although the Knight class doesn’t have access to any elemental damage besides holy. Also, I know I’m probably in the minority but I really enjoyed using one-handed maces in MS, kinda sad that the warrior classes seem to only get to use swords (one-handed or two-handed being the only variability). 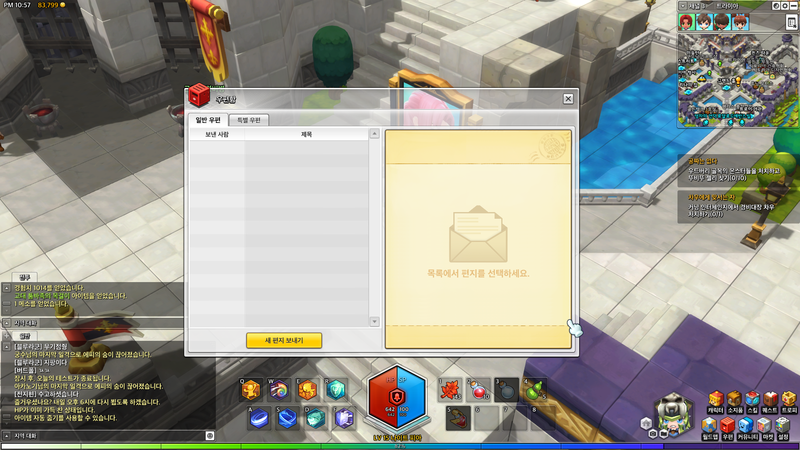 MapleStory 2 Alpha Test – Day 4! 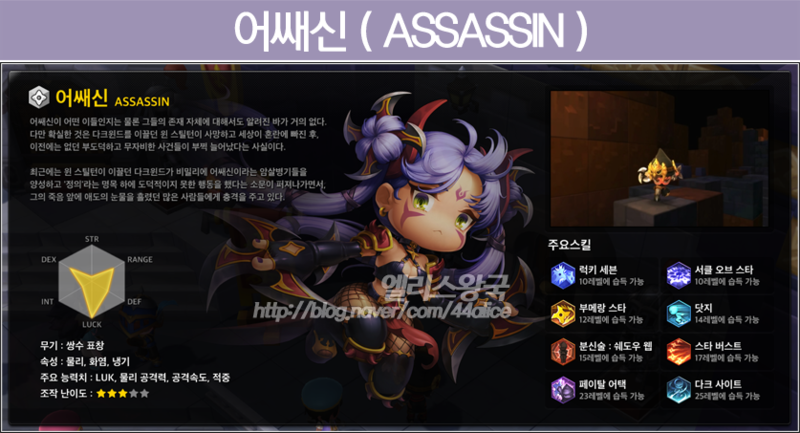 MapleStory [Orca & Suu]!